There was one more, very important reason we didn’t attend Burning Man this year. (See previous post.) For all that our three visits to the desert have provided a wonderful bonding experience for myself and Campbell, I felt the need this summer to have a family holiday, to involve Posie (my wife) and Noel (our five-year old). Besides, I’m continually hoping that one day we’ll be able to get out to the Nevada Desert together, to which end we didn’t completely abandon the Burning Man ethic. 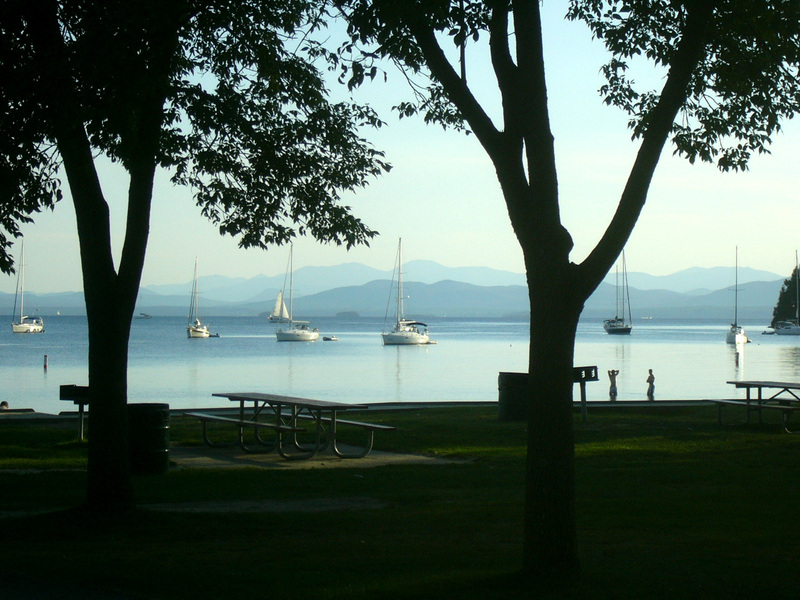 No, we bought a new tent, packed the car with bikes, bedding, and bodies, and set off for a week’s late-summer camping in the wilds of … Burlington. North Beach on the evening we arrived, looking across Lake Champlain to the Adirondacks. This photo by the wife, Posie Strenz. I heard about this rare urban treasure from a Catskills friend who also ran last year’s Burlington Marathon. He said he stays there every year, given that it’s barely a mile from the start and finish line. In fact, he explained, we run right past the Campground at the end of the Marathon – though if you’re paying attention to anything on Mile 25 and 26 other than the finish line, you’re a better marathon runner than me. Anyway, he was right. 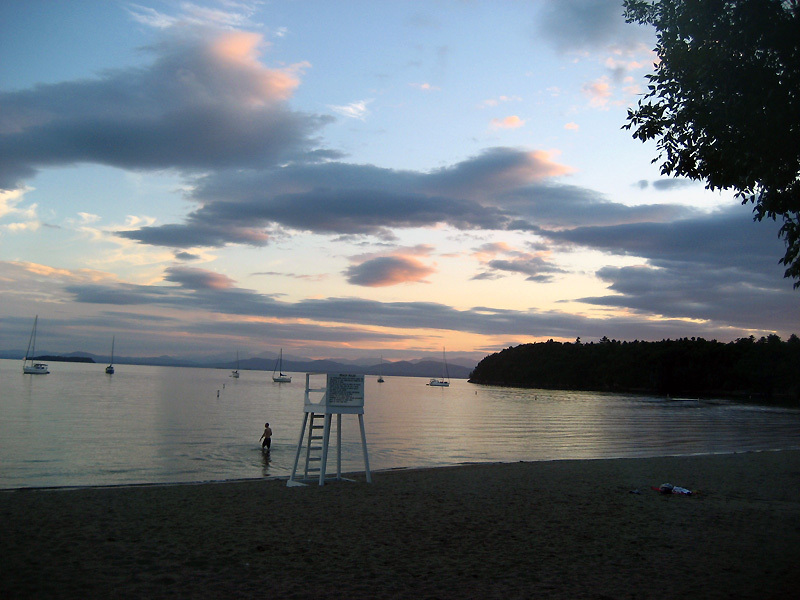 The North Beach Camp Ground is indeed, less than a mile from the center of Burlington. 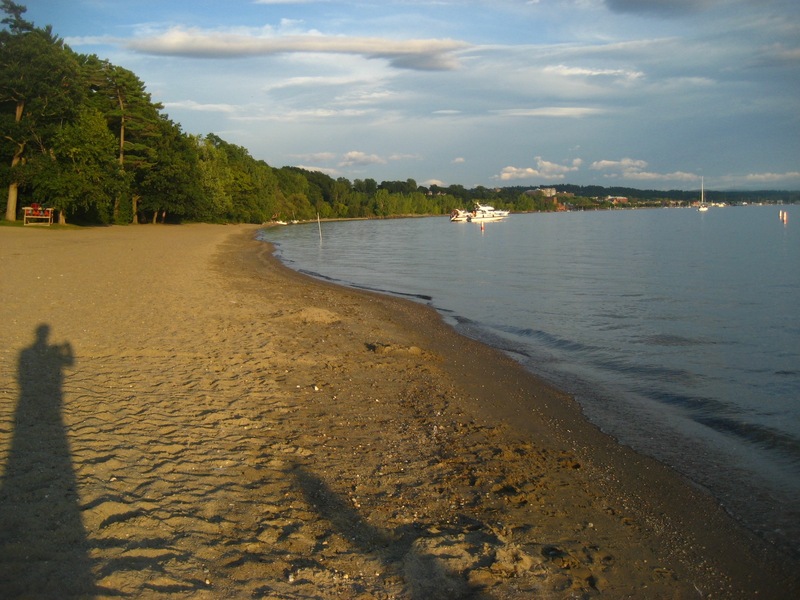 It’s also on the beach: literally, you roll out of the campsite, down a path, and you’re on a sandy, shallow warm-water Lake Champlain beach with stunning views. The Campground is also adjacent to a seven-mile bike (and running) path that connects the City and suburbs, and is widely used by locals and campers alike. And the Campground has hot showers, laundry, a fire pit, grill and picnic table at every bay, free potable water, electricity in several sources – and costs tent-bearers all of $25 a night. What’s not to like? Yep, it’s that high up the list. Burlington, with an approximate urban population of just 60,000, has five Microbreweries to its name; that’s as many as serve all 8,000,000 inhabitants of New York City. Add in another eleven microbreweries across the State, and you have one for every 50,000 people. Vermont is proud of its beer – so proud, in fact, that a healthy majority of restaurants and bars serve it above and beyond any national suds. 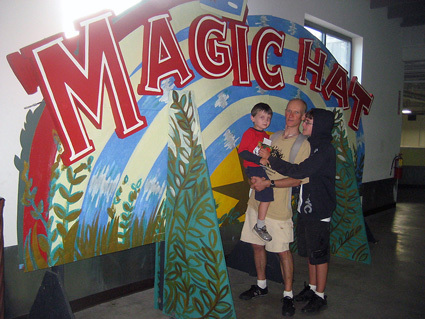 Magic Hat would be the most well-known of Vermont’s breweries, I imagine. A visit to the Factory both for a tour and a taste (and the opportunity to pick up Growlers of new beers that are yet to be bottled or distributed) is an essential part of every Burlington tour. But it’s fighting off a healthy challenge among locals from Long Trail (whose Blackberry Wheat Ale we found by the tap as far away as Lake George, on the journey home), and Otter Creek, whose IPA I fell in love with last year, and which I found at sale price on the very last store we stopped in in the State on our drive home. There’s also Rock Art, whose beers I found a little too much on the novelty side (much though I enjoyed its coriander and orange infusion, I’m not sure I would feel comfortable asking for a “Summer and 75” by name at the bar). And then there’s Switchback, a relatively new Burlington micro-brew, run out of a garage just round the corner from Magic Hat, whose Unfiltered Ale, cloudy and hoppy but simultaneously light and refreshing, was absolutely the hit of my week. (A Switchback Brown Ale was a little too big for my tastebuds.) Switchback, at least for the time being, remains obstinately under the radar; its beer is available only on draught, only in the region, and the brewery receives no visitors except on Saturdays from 1-2pm. It doesn’t even have a web-site (Though it does have a popular Facebook page.) But believe me: it’s almost worth visiting Vermont just to buy it at the bar. I also have to credit the American Flatbread/Burlington Hearth, which has its own micro-brewery on hand, called Zero Gravity. The wide range of beers, including a couple of cask ales, appeared to be of good quality, and sensibly-priced, with the London Calling providing a perfectly good approximation of an English session ale. But it was the full beer list that won me over. Rather than focus only on its own products, the list ventured across the North-East and into neighboring Quebec for some of the best and most interesting brews I’ve ever seen gathered in one place. The Allagash Black ‘07 (First Batch) from Maine ran for what initially seems like an exhorbitant $30 – but once you consider that’s for a wine-bottle size, allow for the alcohol content of many modern macro-brews, and take into account that you can spend $30 on a perfectly bad bottle of wine at a restaurant, it seems reasonable enough. I barely touched a sip of Vermont wine while I was there: the Vermont winters are too tough for vinifera grapes and I’m not a big fan of hybrids. No, small batch, interestingly selected, lovingly and locally-produced beer is just as much fun to discover as wine. And when you’ve been out running as much as I was, it’s that much easier and more rewarding to knock back. 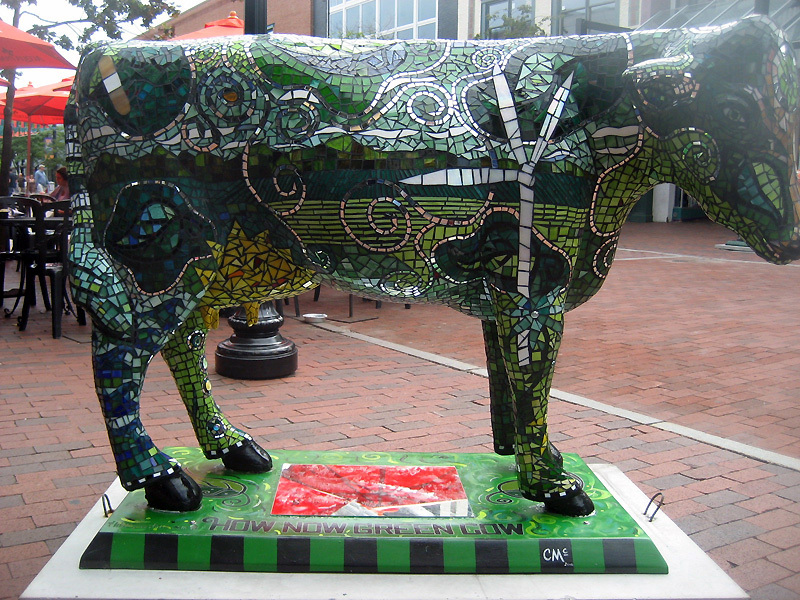 The Cows have Come home to Burlington. It’s a big dairy farm area you see. This one is pretty remarkable when you look at it close-up. 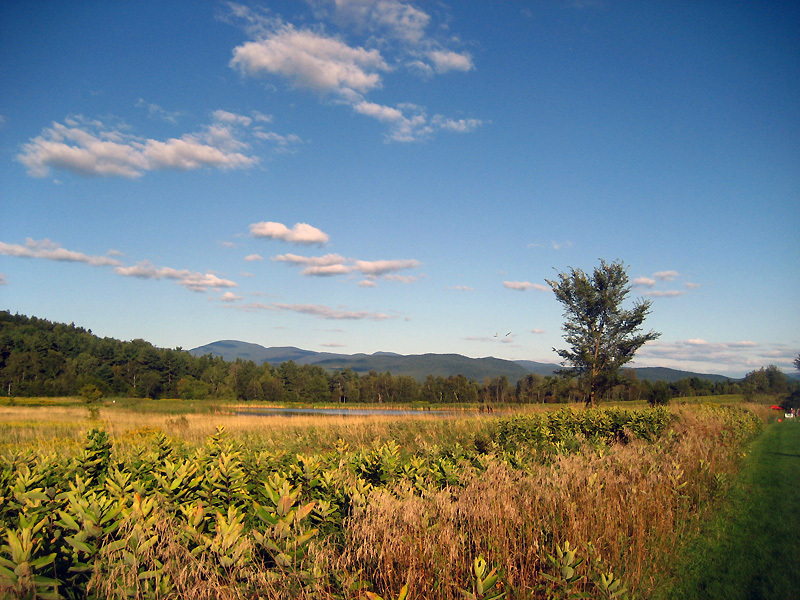 The view at Catamount Family Center, looking towards the Greene Mountains. 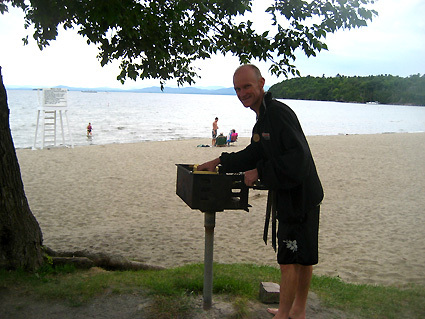 For someone who’s discovered his athleticism in middle age, Burlington is a dream come true, a city where I can run, bike and swim to my heart’s desire – knowing that good food (and even better beer) rewards me almost anywhere I turn. I did some online scouting before we departed – and discovered the Catamount Family Center, just six miles east of the City. We ended up visiting it twice in three days for a couple of races (about which I’ll write separately). While I was glad that my holiday coincided with those events, I was mortified to miss, by only two days, the annual Race to the Top of Vermont, a jaunt up Mount Stowe by either two legs or two wheels, involving some 2550-feet in altitude gain over 4.3 miles. And looking at the mountain peaks both to west and to east – recognizing not just Mount Stowe, but Whiteface at Lake Placid, and knowing of Smugglers Notch, Sugarbush, Jay Peak and Killington all within easy reach of Burlington – it’s entirely understandable why Burton feels no need to switch locations, nor to expect anyone to show for work on powder days! We cooked down at the beach a couple of nights: being able to swim in warm water while waiting for the coals to burn, or play footie with my younger boy inbetween courses, made for two of the best picnics I’ve ever had. But we ate out three nights, as well. All three restaurants were Vermont Fresh Network Members and served almost exclusively local beers and other drinks. Of the three, The Daily Planet, a highly regarded, long-standing local eaterie, offered a vegan main course as a matter of routine, had excellent wine and beer choices, and an incredibly amenable waitress, but the food fell a little short – and I know that Posie was unhappy that her chosen fish was off the list. (Though that’s what you get for Sunday night dining.) The Skinny Pancake Company, a creperie by any other name, was cheap and cheerful and a great place to sit outdoors and look out on the lake with cheap drinks: when it turned out they’d run out of cider, our server suggested we let him mix Posie non-alocholic apple cider with champagne, charged us all of $2 – and then gave us a second round on the house! The crepes were decent, though I preferred the sugar and lemon dessert crepe to the vegan monster main course. And I was very taken by the aforementioned American Flatbread/Burlington Hearth, which might be an upscale pizza restaurant and microbrew pub by any other name, but where I welcomed the opportunity to mix and match my flatbread toppings – with Chicken of the Woods mushrooms among the options. I suspect there are better restaurants to be had at a higher price: I had my eye on L’Amante in Burlington and Sauce Bistro in Shelburne. But as a side-note, both Healthy Living and City Market/Onion River provide excellent organic and other local foods in a supermarket format. We picked up Liz Lovely’s vegan cookies at the former supermarket and fell in love with them. I was similarly impressed by Vermont Nut Free‘s Tanabar granola bars that I bought at a bike store. On our drive south out of Burlington to go home, we passed proud farm after proud farm, and it was all we could do not to find space for another meal in Vergennes, a village that was pretty as its name. Vermont loves local food. We love Vermont. 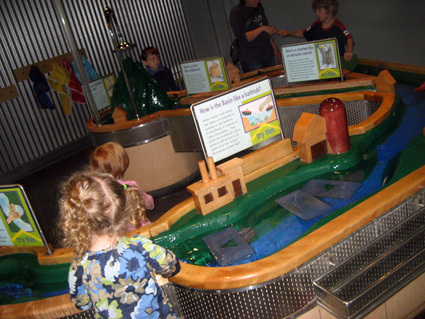 A hands-on opportunity at Echo for kids to discover how waterways work… and to get wet in the process. Every City needs an indoor adventure center to keep the kids entertained on those rainy days. We visited the Echo Lake Aquarium and Science Center on the waterfront, on a rather dank Monday following a heavy storm Sunday night and both boys, of such different ages, were entertained throughout. Echo is essentially an education complex designed as entertainment, which is the right way to go about it: lots of fascinating history about the Lake, the surrounding mountains, the life forms and the climate (and the damager we are doing to it) accessible through interactive displays, hands-on operation, and a wider variety of closeted animals than I’m typically comfortable examining – with a particular focus on eels, frogs and snakes. We picked up hundreds of fascinating tidbits along the way: now, unlike my kids, I just have to remember some of them. No people in this picture, just about. And that’s why I like it! They’re proud of this one. Vermonteers in general, Burlingtonians in particular (I just made those words up, by the way), pride themselves on their pleasantries. Maybe it’s something about being so close to Canada, but they’re genuinely warm, friendly, and eager to please. This was true of the many encounters I had with staff at the multitude of outdoor stores, certainly with those in the restaurants we frequented, but it was also evident in random encounters – like the guy unloading his groceries who gave me back-road directions to Magic Hat on my bike, the car park attendant who didn’t bother charging me the usual visitors fee in the middle of town, or the dad sitting alongside us at the Skinny Pancake who heard us talking about beer, got chatting, and soon enough revealed that he works for a Pro Tools plug-in company called Soundtoys, lived in Montclair for ten years (my wife’s hometown) and would be taking his teenage kid to see LCD Soundsystem when they hit town at the end of September. It’s the quality of these one-off encounters that leave such a warm and fuzzy glow and which will ensure that, while Burning Man remains top of my list for late summer camping next summer, I might very well return to Burlington for next Memorial Weekend’s Marathon – and this time bring the family, camp out, and enjoy a longer stay. Looking south at sunset to Burlington from North Beach.